U.S. Air Force F-22 Raptors from the 95th Fighter Squadron, 325th Fighter Wing, Tyndall Air Force Base, Florida, refuelled and trained with Spanish Eurofighter Typhoons and F-18 Hornet during an F-22 forward deployment to Albacete, Spain, Aug. 16, 2018. The squadron of F-22s, along with Airmen and associated equipment, is part of a Flying Training Deployment forward deploying from Spangdahlem Air Base, Germany, to operating locations within NATO member nations to maximize training opportunities, strengthen alliances and deter regional aggression. 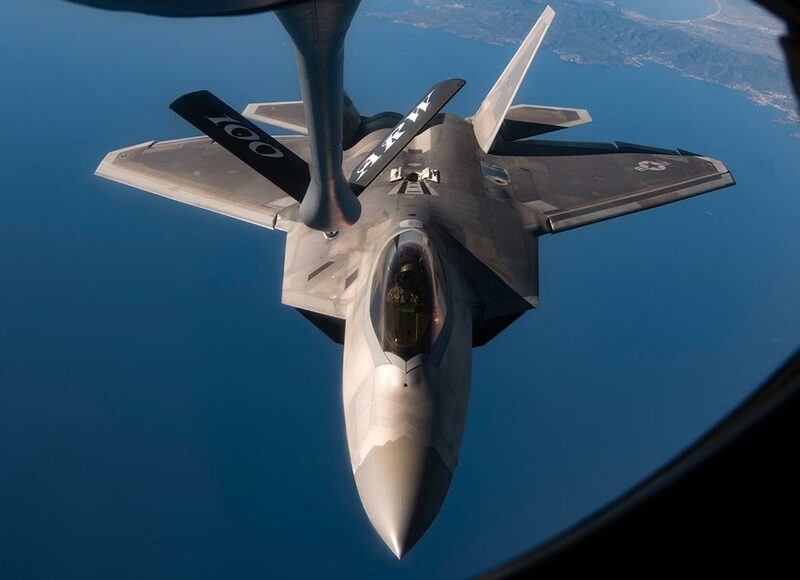 The training involved F-22s receiving in-air refuelling from a U.S. Air Force KC-135 Stratotanker assigned to the 100th Air Refueling Wing, RAF Mildenhall, England. 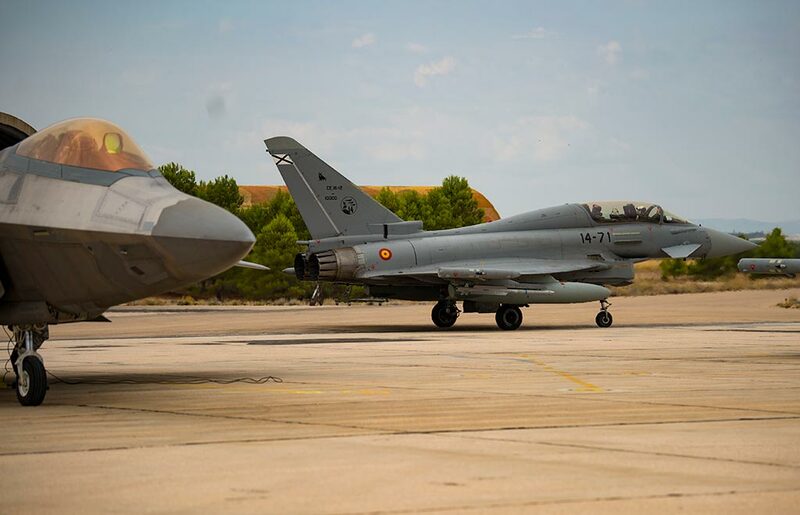 After refuelling and entering Albacete airspace, the F-22s trained with Spanish Eurofighter Typhoon aircraft by practising various dogfighting scenarios and manoeuvres. 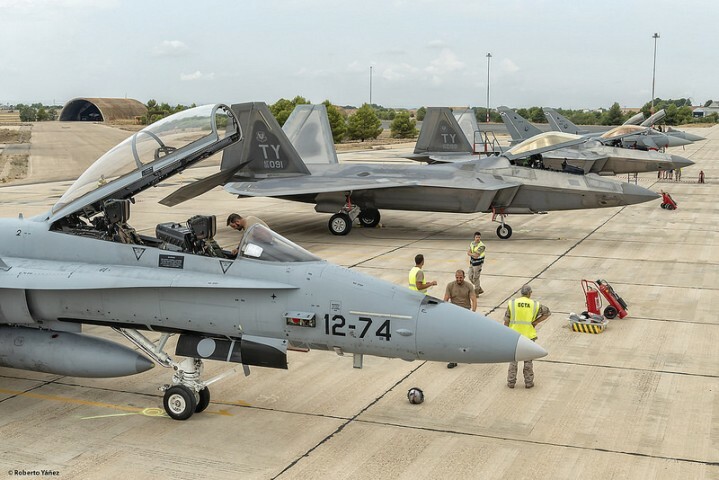 For the Spanish Ejercito del Aire it has been an excellent opportunity to evaluate the capabilities of the Albacete Air Base and the Tactical Leadership Program (TLP), to host an exercise that has the participation of a 5th generation aircraft, as are the USAF F-22 Raptors. Exercises of this type represent an excellent opportunity for instruction and training that allows a joint assessment of the capabilities of the aircraft, two of US manufacture and one European, in a demanding tactical environment. The exercise consisted of two independent missions. 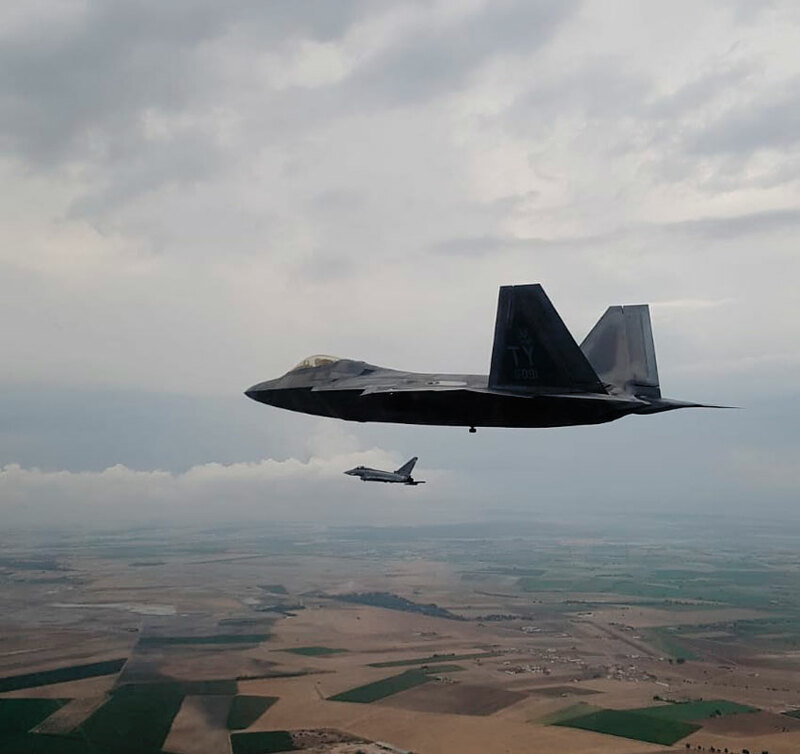 After the takeoff of two Eurofighters from Albacete Air Base, they carried out a mission with one of the F-22. Already in the work zone, dissimilar combat manoeuvres were carried out between fighters of different characteristics. At the same time, an F-18 Hornet of Ala 12 took off from Torrejón Air Base to meet in the zone with the second USAF F-22 Raptor to perform the same type of mission. Then the two Eurofighter of the 14th wing, in the air police mission, located the trace corresponding to the F-22 and made interception manoeuvres for their subsequent identification. In the event of any offensive action of the attacking plane, they made defensive and coordination manoeuvres to maintain the enemy’s control zone. 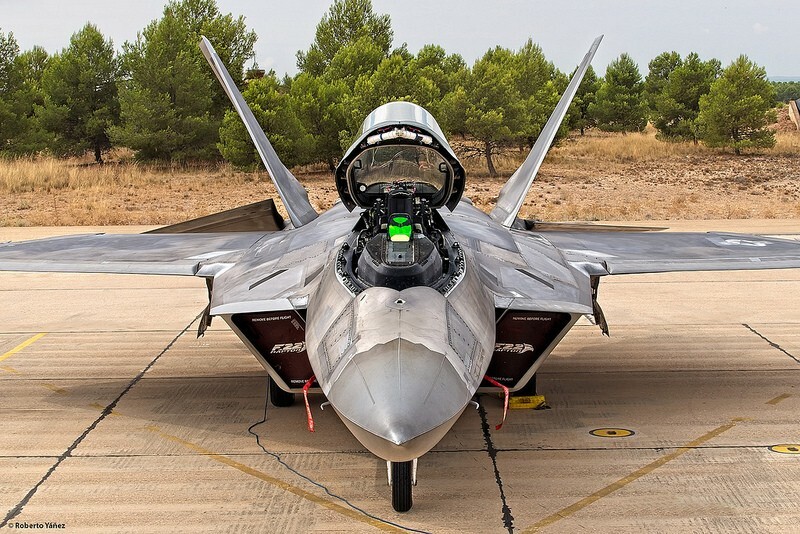 Once the work was done in the sector, each American F-22 met with the Spanish fighters assigned and proceeded together to land at the Albacete Air Base. Following training, the aircraft landed at Los Llanos Air Base where the pilots from both aircraft spoke to media about the training. 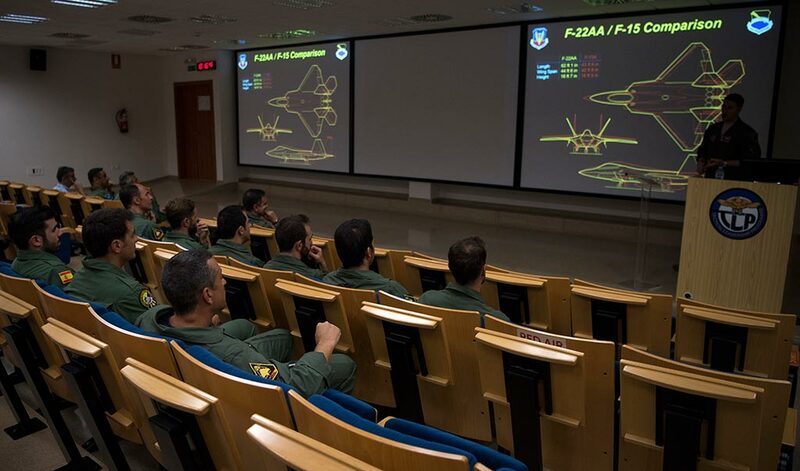 Afterwards, Spanish air force pilots and military personnel from NATO allied nations attended a brief held by the U.S. Air Force on the capabilities of the F-22. 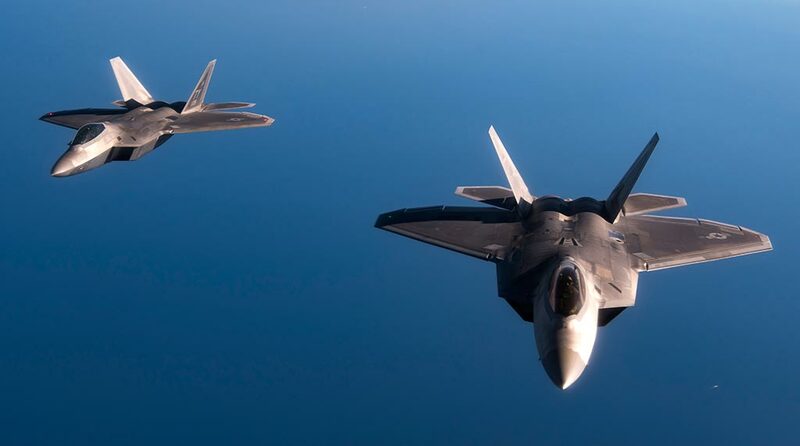 “In the briefing, we went over what the Raptor can do, why we have the Raptor, and what support it can provide to our NATO partners in the fight,” said U.S. Air Force Maj. Michael Frye, an F-22 pilot and 95th Fighter Squadron weapons officer. The U.S. has a longstanding relationship with Spain, working closely together on a range of global challenges, that include promoting international peace, security and economic prosperity.